This is a summary for Brinley from 16.5-17 months old. Poor Brinley had a cough at the end of this period. She coughed constantly through naps and through the night, even with me using all of the coughing tricks I know (thanks Vics and doTerra…). She can’t have slept well. She slept an hour or more later each morning and took longer naps. She did not eat well during her sickness. Croup and RSV were going around near this time so it was concerning when she got sick. She started with a fever. Fevers are pretty common in young ones so I didn’t worry. By the fifth day of the fever, I started to be concerned and decided to take her to the doctor, but then it went away. Then she got the cough. The cough never got terrible, just always there and annoying. Did you know (and I just learned this) that croup is an actual sickness and not just a cold gone bad? I always wondered. Apparently some kids get croup worse than others–some seem more like a cold–and it is something to do with genetics. We put some presents under the tree and Brinley was obsessed. We had to do the whole teaching to not open presents just like teaching to not touch the ornaments on the tree. Then we did my family party a couple of days before Christmas and confused her by encouraging her to open presents. Most kids around this age open one thing and just want to play with it. 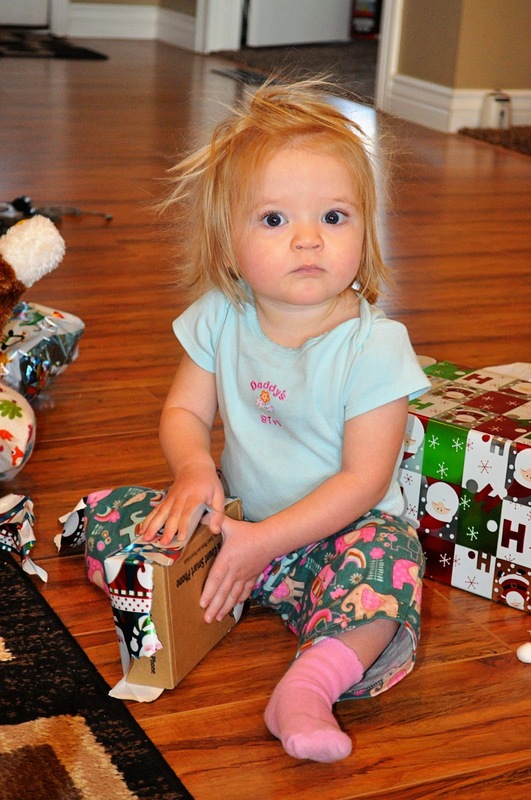 Not Brinley–she wanted to see what other amazing things were wrapped and she could have unwrapped forever. Then we came home and confused her some more by instructing her to not open presents again. Then two days later told her to open. Parents can be so confusing. On Christmas we were with my husband’s family. His sister has a son a year older than Brinley, but not much taller than she is. After observing him for a a bit, she decided she could walk too. So she did. She just started walking around everywhere and has pretty much stuck to that. She sometimes still walks on her knees if it is more convenient but for the most part she walks now. During the break, my husband took a lot of days off. And Brinley trained him well. She was sick and he is a sucker for his little girls so it was the perfect moment for her to train him to hold her at all times. And not just on his lap–he must walk around. She continued the training even after she was better. Wrapped around her little finger. But here is the nice thing about kids. She trained Daddy, and she knows it. She knows she didn’t train Mommy and when it is just the two of us, she carries on as normal. Kids are smart. They know better than we know who does what and who allows what. The sickness wasn’t enough–she also needed to be breaking molars, too. I think I will get her an amber teething necklace. I hear good things and with her extra collagen it should make us all happier over the next year as the really painful teeth come in. My daughter loved opening too! Thankfully she didn't get confused though. She was so good at it too, it surprised me. I remember having to help my son a lot more. Just curious…did you know there is a picture of a woman in a bra on your website….then it says "play free!" Seems totally out of place, and a little strange. No! I don't see it. Where is it? It's gone now. It was like an ad. It was between your posts yesterday. Today I see one for American express… haha, much better! Glad it's gone. I didn't think you would want that there!! No definitely not! I went in and did some digging and banned any category of ads that I thought could have put that there, so thanks for letting me know.